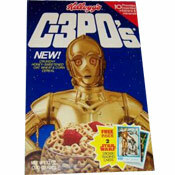 The term "Star Wars" might seem like a strange entry in the glossary of breakfast. It actually appears here thanks to a lucky coincidence. In the the summer of 2008, I (Mr Breakast) was on vacation in Maui. Visiting the town of Lahaina, I stumbled upon a local Goodwill store. I went in looking for vintage Hawaiian shirts and hats, but what I found would change the face of the breakfast glossary forever - by adding another term. I stumbled upon a cookbook entitled The Star Wars Cookbook: Wookie Cookies And Other Galactic Recipes (1998). It was filled with wild recipes for every meal, but the breakfast section was most intriguing. After vacation, I put out the word to some key Team Breakfast members that I was looking for more Star Wars recipes. 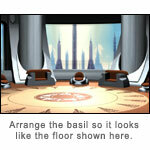 They began submitting recipes and even turned me on to another Star Wars Recipe book. 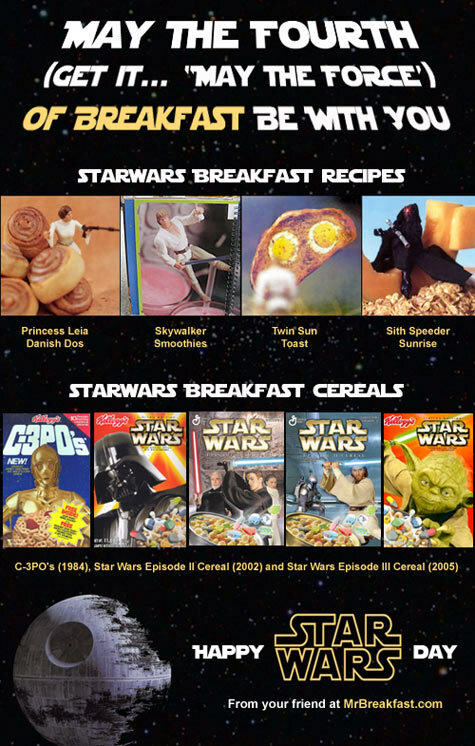 What follows is a compilation of Star Wars breakfast recipes along with information to get your hands on Star Wars cookbooks. 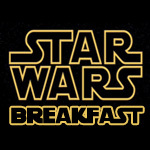 If you have a Star Wars breakfast recipe that you like to submit, the force is with you. All you need to do is click here and enter it. 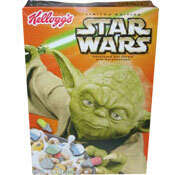 May the force of breakfast be with you always. 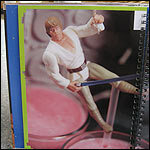 "Luke definitely has the Force on his side, but sometimes he gets an extra boost from these scrumptious smoothies." This is a nice, basic smoothie recipe with some ideas to vary the recipe to your liking. This is a simple cinnamon roll recipe using store-bought pizza dough. 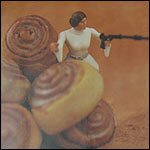 When's the last time you had a Star Wars-themed cinnamon roll? 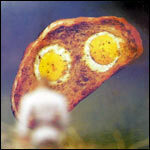 This recipe is a Star Wars variation on the eggs-cooked-in-bread recipe often called Birdies In A Nest, Popeye or Eggs In The Hole. This is a basic pancake recipe with the nice twist of adding a pineapple ring right before you flip. 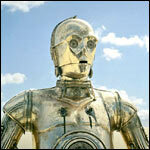 The round gold ring is supposed to remind you of the famous movie protocol droid. 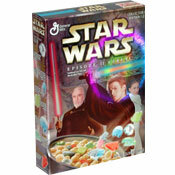 "If you want to know the secret behind Darth Maul's dexterity and determination, you just might find it in this nutritious breakfast. 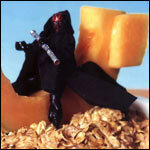 This wholesome speeder slice of juicy mellon atop a dune of sweet, creamy oatmeal will keep you zipping around all day." This is a simple Italian Frittata. Basil is placed in a pattern over the final dish so the frittata looks like the floor of the Jedi Council Chamber in Star Wars Episode I. "Great Breakfasts" Start With The Letter "S"